It is well known that the Torah contains appearances of anachronisms. I chose the word appearances specifically, because not every one so designated is really problematic (from the Mosaic versus mosaic standpoint). For example, the references to Pelishtim in Bereishis. It is now known that the Pelishtim of Tanakh were Aegean “Sea Peoples” who migrated to Canaan after the Patriarchal period making it quite unclear how the Avos interacted with Pelishtim. However, it has rightly been observed by Shalom Carmy and others that carefully reading Tanakh shows that the Pelishtim in Bereishis live in a completely different coastal region of Canaan from the Pelsishtim of David’s time. Furthermore, while the leaders of the Pelishtim in David’s time are called “serannos”, thought to be a variation of the Greek tyrannos, in Bereishis the leader is a melekh, which is what the Semitic word would be. Also, these leaders had Hellenic type name and elsehwere in Tanakh the origin of the Pelishtim is given as Caphtor (Crete) which would indicate an awareness of their origin among the Israelites. That means that there is good reason to regard the Pelishtim of Bereishis as a different, earlier people entirely. It would be not unlike modern British people who are mostly descended from Angles and Saxons rather than aboriginal Britons. Same name, different people. As far as I am concerned this is unconvincing as an anachronism. An anachronism such “And the Canaanites were then in the land” (Gen. 12:6) is more problematic. It seems like it can only be explained away by disputing that translation, or speculating as Ibn Ezra did, that the Canaanites of that time were actually invaders who displaced earlier inhabitants. It seems to me that this one is more difficult than the one about the Pelishtim. Whether there is a satisfactory explanation for this one is in the eye of the beholder. But the anachronisms become more difficult. There is the mentioned of the place called Dan in Gen. 14:14, despite that the place is renamed that by Israelites in the book of Joshua and ostensibly called so after Shevet Dan. Not so easy to explain that one. The usual explanations for these more difficult anachronisms is that they were prophetically written. That may be, but that is forced by the question and not the plain meaning. Why isn’t Salem then called Jerusalem in Genesis? There are any number of verses that could have been written anachronistically but prophetically. In short, this answer seems to be applied with out any rule or method. Even more difficult, perhaps, is the one in Gen 36:32 “Now these were the kings who reigned in the land of Edom before any king reigned over the children of Israel”. The meforshim say that Moshe could have been considered the king of Israel. Well yes, but….you know. The kashya is better than the teyrutz. Anyway, I plan to treat the issue of so-called anachronisms and Moshaic authorship in a better post at a later date. For now I thought it would be interesting to simply compare the treatment of these three—Gen. 12:6, 14:14 and 36:32—in three popular Orthodox chumashim in English. Just a sampler. As you can see, these are treated differently in the different chumashim. Sometimes tackling the problem head on, sometimes ignoring it entirely, sometimes raising the problem but getting wordy and adding interesting peripheral tidbits of information without addressing it. But I bet he knows lots of Shev Shmaitza! Reb Gil encountered a mesivta rebbe who seemed unaware either that Immanuel is a Hebrew name and/ or that is from Yeshaya 7:14 (I'd like to see this rebbe debate a missionary!). The joke in yeshiva was that one learned Tanakh from scriptural references in the Gemara. Why learn if you don't have to? they weren't talking about something within the Gemara but about how girls aren't "supposed" to study it....one girl said about it, "Why would you learn Gemara if you didn't have to?" She was referring to the belief that learning Gemara is a mandated obligation that Jewish men have to perform, but which Jewish women do not. But I thought that was a terrible approach to learning and is what is wrong with so much of the world today. Obviously this girl seems vapid and intellectually incurious. Lots of people are. And since she was probably a teenager, not at the peak of her intellectual potential. But its just as likely that its less that and more that she's convinced herself that "there's nothing to see, move along" in the Talmud because it makes the fact that she will never engage with the most important Jewish primary source which a great deal of her lifestyle and beliefs come from a smoother pill to swallow. The theme developed by Gosse, that the physical evidences of an old earth were but a plant by God making the earth look old while it really is young, recurs often in the blogosphere. The usual rebuttal is that God didn't/ wouldn't fool humans. Why should God have created a universe that looks 15 billion years old if it's really 6000 years old, and worse, we're required to believe that its 6000 years old? Furthermore, there is no indication in Tanakh that God operates in this manner. Well there is. One word: anthropomorphism. At least according to the Rambam. Whether on dogmatic or philosophical grounds, most Jews today over age ten probably do consider the physical references to God in the Torah to be non-literal, as per the Rambam. But the facts are that the Torah gives the impression of God having a face, back, hands, emotions, speech etc. Rabbinic literature develops this even more, with God wearing tefillin, for instance. The skeptic will say that the Torah does in fact mean these things literally, but that isn't the point. Jews don't take the anthropomorphism literally today and Orthodox Jews certainly tend not to believe that the intent of the Torah is to assert that God has a finger or nose or gets angry. Le-shitaso, doesn't this demonstrate, at least in principle, that Orthodox Jews like myself who are doubtful that God would create a universe looking old while requiring us to believe that it is young can't really claim that God wouldn't do that? That's like saying God wouldn't say that He has a face if He didn't have one. Obviously there are ways of side-stepping the issue entirely, for example by claiming that the Torah doesn't say or assert that the universe is presently about 6000 years old. If so, the appearance of the universe isn't a matter of fooling anyone, only a matter of beliving a flawed chronology to be a required dogma. That may be true, but my point is specifically about Gosse and the easy dismissal of him that everyone has given. Update: Mark reminded me of the parsha about nabhi sheqer in the Torah. Here, the Torah specifically says that God uses the medium of false prophets (without obviously sending them) to test us. Another good example; probably a better one. Rosh Chodesh Merachshewan this Wed.-Thurs. In light of the upcoming Biblical month of Bul (I Melakhim 6:38), known to us as Marcheshvan, I remembered an interesting article in Jewish Action a few years ago by Rabbi Ari Z. Zivotofsky about the origin of the term for this month. Pointing out how in Akkadian the waw and mem sounds interchanged, 'Marcheshvan', in Babylonian, derived from Akkadian 'w'rach sh'man' which is cognate of the Hebrew 'yerech shemini,' or 'eight month'. You know, like our ineptly named 10th month October. Zivotofsky speculates that the Yemenite Jewish pronunciation of something like 'M'rachsh'wan' might be closer to the original than the Marcheshvan of Ashkenazi tradition. He also discusses the popular folk etymology which holds that the month is really called Cheshvan, with 'mar', meaning 'bitter' in Hebrew an addition much like 'menachem' is often popularly added to 'Av'. Various reasons were given why Cheshvan is 'bitter', including that this is the only month without some sort of holy-day, Biblical or rabbinic. Naturally this is what I was taught as a child, so what else is new. The posekim permit either Marcheshvan or Cheshvan in legal documents, because popular use has made even Cheshvan correct. Languages develop, you know. Obviously drawing conclusions from googled terms have their limits, but try googling cheshvan versus marcheshvan. The former is favored, literally, ten to one. A fleeting thought came to me when Bereishis was read in schul on Yom Tov. The words are "be-tzelem elohim" and not "be-tzelem elokim". I mean, of course I knew that already. But it's interesting how conditioned we become to things. The phrase "be-tzelem elokim" is so popular that it and not the real thing sounds authentic to me. Satmar chassidism use microphones on Yom Tov. I didn't know that either. There is a very famous Rashi on the words "And these". There is another famous Rashi [Vayikra 25:1] on the words "On Mount Sinai"
This is a famous Rashi quote. In Hebrew it is 'Acharon, acharon, chaviv." Rav Tatz once quoted the famous Rashi which asks the question, "Why is the story of the spies juxtaposed with the punishment of Miriam?" Quite often, when Rabbis speak, the refer to a " famous Rashi," a "famous Gemara" or some other source which they refer to as "famous." I realized that what "famous" really means is "I learned it!" Oops, that last one is an observation on the phenomena. Anyway, I think to reduce it to "I learned it!" is to misunderstand the useage of the term. It's true that sometimes its clearly used because the speaker wants to lend that particular Rashi some kind of elevated level authority. But in some sense, there really are famous Rashis, Rashis that have been repeated so many times that they are well known, while others are not "famous" at all. A study of the phenomena and any patterns and values it may reveal might well prove fascinating. Is a plus sign against halakhah, or offensive? the arithmetic textbooks of the Israeli ministry of education have, under Orthodox pressure, lopped off the top of the plus sign. I assume this is true, although its unclear if this is only for certain textbooks in certain schools in Israel. Wow. It's a good thing we use Aramaic and not Hebrew script, because the ancient letter tav was in fact more or less the cruci-plus sign: +. Miriam posts some interesting and surprising info about the historical development of Simchas Torah, the most recent Jewish holiday, also one of the most lovely in my opinion. I've been memed by Krum as a Bagel and Wolf . That means I have to respond, of course, and I'll do just that after the hag. A thought: RSRH used to encourage the 'well-bred' among his constituents to set an example by carrying their lulav and esrog to shul through the streets without shame. I don't think many of us are living in a place where one even thinks of feeling ashamed of being seen with a lulav. Nevertheless, we can be proud of our beautiful mitzvos as we carry our lulavim and esrogim to shul. Have a happy yom tov! Moshe points out that he's "sure that the Netziv was much greater than R' Slifkin. On the other hand, I am sure that R' Slifkin gave much more thought to the topic of the camel, hare and hyrax than the Netziv did." That's a very interesting point, one which is kind of the elephant in the living room that no one mentions. What exactly makes gedolei Torah who have not thoroughly researched a narrow Torah topic more knowledgable about that topic then someone who has? There are areas of Torah where individual experts quite frankly know more about that one topic than anyone else, even though there are those who are qualitatively and cumulatively greater in Torah then them. Now Onkelos is being written out of the masorah? The Slifkin story just won't disappear. And I'm not sure it should. Anyway, a talmid of R. Meiselman took it upon himself to respond via a blog. He does not disguise that his purpose is to defend R. Meiselman and it takes the form of defending his position that R. Slifkin's books indeed contain heresy and disresepct toward tradition. Targum Onkelos is not an indication of what is or is not a tradition from Sinai. Rav Meiselman explained that Targum Onkelos was written before the dispensation of Rabi Yehudah HaNasi to make public written records of the Oral traditions that explain the written Torah. Onkelos had to confine himself for the most part to literal translation come what may. This is the only part of the issue that I want to concern myself with for now. Is this not a surprising and novel declaration? Again, this is the talmid's paraphrase of the rebbe's position, but taking it as it is, the position is this: Targum Onkelos is a) not an authorized Torah she-be-al peh translation and 2) Targum Onkelos is a literal translation, one that, presumably a Karaite or a Protestant Christian could have made. Now, I know that the qualification of "for the most part" conveniently explains why Onkelos is not in fact a literal translation. Who is to say what "for the most part" means? Well, I'll say this: "for the most part" it is a "literal translation" doesn't apply to Targum Onkelos, which often deviates from the literal meaning! I'm not sure what is more startling, the idea that R. Meiselman doesn't recognize that Onkelos is a very Midrashic translation or that he does but says that Onkelos is not a valid source of Torah she-be-al peh anyway. edit: A clarification by a talmid of R. Meiselman regarding his views on Onkelos. I will tell you frankly, the American ben torah has achieved great heights on an intellectual level. However, experientially he is simply immature. When it comes to Jewish religious experience, people of thirty or even forty years of age are immature. They act like children and experience religion like children. As a result, Jewish youth is inclined and very disposed to accept extremist views. They do this to such an extent that my own students examine my zizit to see whether they are long enough! [Laughter] The youth is extremely pious, but also very inconsiderate. Sometimes they drive matters to absurdity. Why? Because they have no experience. Their experience is very childish, simply infantile. When it comes to experiencing the emotional component of religion, boys who are really learned simply act like children. This is why they accept all types of fanaticism and superstition. Sometimes, they are even ready to do things which border on the immoral. They lack the experiential component of religion, and simply subsitute obscurantism for it. I have never seen such obscurantism as I see among some of my students today. After all, I come from the ghetto. Yet I have never seen such naive and uncritical commitment to people and to ideas as I see in America. This is the main problem we have today. In a moment of striking candor; when my colleague Rav Yehuda Amital first visited these shores almost twenty years ago (that is, around the same time the above remarks were made, in 1974, ed.) the Rav commented to him: "You know, I have devoted talmidim....If I were to announce a shiur at two o'clock in the morning, they would come en bloc. And yet, deep in their hears they think I'm an apikoros." The remark was laced with characteristic humor and confined, presumably, to a select group. Nevertheless, it gave vent to a genuine, if painful, sentiment. Yom Kippur was awesome. I find that as I get older the fasting really helps create a proper mood, for one thing. For another, despite lousy weather, it was a cleansing experience exactly as it should be, or as a mikva should be (mikva does nothing for me that I notice). I also found that the more I struggle with, if not faith per se then auxiliary issues during the year, the more I feel like I have a right to sit in shul in a tallis and kittul for an entire night and day, and the more affective tefillah is for me (that "affective" with an "a"). I am an anonymous blogger and plan to stay that way. Other than my wife I don't know if a single person knows I'm me. Which means, also, that out in the cold, real world I don't talk much about blogs. Which means that I don't know J-bloggers 'in real life', or at least I don't know if I do. But yesterday after mussaf a fellow in shul and I got to talking and he asked me some questions about certain issues that are regularly raised in the J-blogosphere, and we had an interesting conversation. Now, I don't think I have a scarlet B on my forehead and it didn't really come off like he was fishing for anything. I wonder if he is a blogger--even a blogger that I 'know'. In fact, I wonder if I know any of you folks out there. Hmm. I started a conversational ulpan today as a way of improving my Hebrew-speaking skills. Don't ask me why, but one of the words which we started discussing is the Hebrew word for husband - ba'al. As it turns out, ba'al also means owner in Hebrew, and this dual meaning does not make for the most politically correct of terms. Of course, as a friend pointed out, "husband" is also a word which does not have the greatest of connotations. Husbandry is a term used for someone who takes care of a farm or animals (now I'm not sure which is worse, husband or ba'al!) But the difference, it seems to me, is that the word husband is not used so frequently for animal husbandry (at least not in my circles). When one says husband, whatever its original meaning, we think husband and wife. Ba'al however, easily can mean husband or owner in modern Hebrew. (And if you are a student of the ancient Near East you might also associate the word ba'al with that ancient Near Eastern storm god, ba'al). It turns out, my ulpan teacher told us, that there is some movement within the young Israeli community, to put an end to calling one's husband ba'al, and to replace it with the phrase ben-zug for husband, and bat-zug for wife. Ben or bat zug means partner or spouse, and although I have never heard anyone actually use this term, I think it has quite a nice ring to it. I agree, ben-zug and bat-zug do sound pretty. And if you think about it, ba'al isn't very PC. While not a woman I am part of a group that ostensibly has to deal with words like "jew" used as a verb meaning "cheat" and "pharisee" as a synonym for hypocrite. I think I do understand why words might rub one the wrong way. But I can't seem to agree for something like this. Putting aside the lashon ha-kodesh angle--this is arguing with etymology! Whatever the word connoted in the ancient Near East millenia ago today it connotes a husband in the sense of an equal relationship where neither party owns the other, certainly when it is used in the context of marriage. Does anyone really think of property when marriage is discussed in Hebrew? I've never read the Shomer Negiah blog (although I was kind of aware of its existence). Apparently she's had her first kiss (and it was a good one). I didn't read through all the comments yet, but truly the ba'alat ha-blog, her story and the reactions to it reflect the condition of our community today, whatever that may be. In 1868 a large inscribed stone was found by a German named F.A. Klein in Dhiban in the Judean desert. 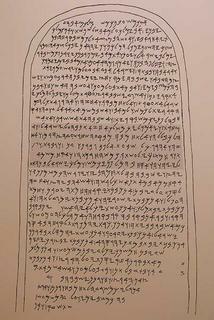 It came to be known (then) as the Moabite Stone and is now called the Mesha Stele.The stele was soon broken by overeager Bedouin who broke it into pieces, either for luck or because they thought they could get more money for more pieces. Fortunately a papier-mache squeeze had already been made of it, so we still have (a copy of) it. This inscription is important because it is one of only a few examples of ancient Hebrew (called, in this case, Moabite largely for political reasons--the dialect is almost identical to the Hebrew of the Torah). It also provides a Moabite point of view. Mesha was the 9th century BCE king of Moav mentioned in 2 Melachim 3. 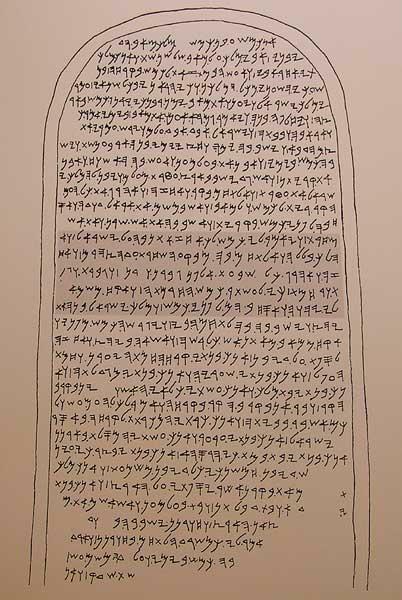 Lately I've been trying to polish up my ketav ivri reading and writing skills, so I was recently reading (okay, transcribing, really) the Mesha Stele (without having read a full translation of its contents). Coming across the first instance of the world Yisrael was awesome (5th line, looks like this: ). Seeing the name of Hashem (yes, "the name of the name, I know) on line 18--wow! I don't know if I'd describe the feeling as a religious experience per se, but it made me swell with satisfaction. I can't even put into words how moving it was to read that word (and Yisrael, mentioned six times) in ketav ivri from the days of the Nevi'im, even if it was "one of theirs" and not one of ours. To read a translation and transcription of the letters into Hebrew check out Wikipedia. Worth noting is the almost complete absence of plene spelling (ma'aleh) in the stele, evident from the very first word, אנכ , which is spelled without the י that would make it a proper Biblical Hebrew אנכי . In fact, one of the distinguishing features of ancient Hebrew is that it employed letters like ה, ו and י as vowels to indicate proper pronunciation, a feature that was a revolution in alphabetic writing. This is almost totaly absent in the Mesha Stele. According to their IRS filings, Lakewood's Beth Medrash Govoha's "Primary Exempt Purpose" is: Educational institution involved in Academic Talmudic Research with undergraduate and graduate programs (Info cribbed from the old Protocols). Now it seems the Lakewood internet ban has been expanded. An academic research institution with undergraduate and graduate programs without internet access? Yes, absolutely. Reconstructing the Bush doublet. Who was this George W. Bush? The local wholesale lulav market is in uproar because a single importer, who has managed to corner the local market, is set to charge five times the normal wholesale price for the palm fronds used on Succot. Avi Belali, of Moshav Segula near Kiryat Gat, accomplished the impossible, said local wholesalers. While hundreds of lulav traders and their customers have failed in their attempts to put pressure on Egypt to loosen the ban on the export of lulavs by enlisting politicians, diplomats and Jewish interest groups both locally and in the US, Belali succeeded in importing 250,000 lulavs. Instead of charging the accepted $1 per lulav to wholesalers, Belali has let it be known that he will charge at least $5. Judisches Ceremoniel, oder, Beschreibung dererjenigen Gebrduche. Nurnberg : Verlegts Peter Conrad Monath, 1724. This book is an example of a specific genre in the writings of Christian Hebraists, which includes works that describe the customs, ceremonies and rituals of contemporary Jews. Like many writers of these books, Paul Christian Kirchner was a convert. Beside this book he published a work in 1719 that was aimed to help with the conversion of the Jews, entitled Lehar'ot or emet la-yehudim. 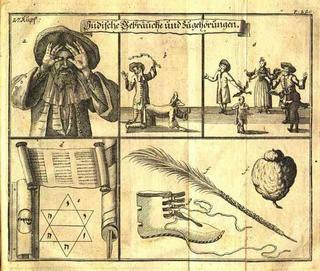 The Judisches Ceremoniel was originally published in 1717 and later on was revised and enlarged by Sebastian Jacob Jungendres (1684-1765). According to Jungendres the original work by Kirchner was inaccurate and biased because he wanted to prove the evilness of the Jews. 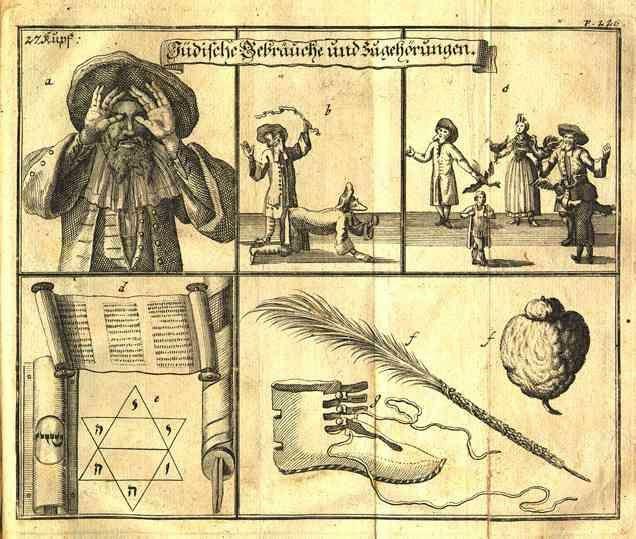 Another addition to this imprint are 27 engravings that portray various customs and ceremonies held by the Jews. The book was published at least eleven times between 1717 and 1734, including a Dutch translation, and was reprinted in 1974 by Olms and in 1999 by the Reprint-Verlag, Leipzig. The phenomenon of Christian Hebraism before the modern era fascinates me. Although strictly speaking this work is not from before the modern era and its author was actually an apostate Jew, I think the illustration is really interesting. As you can see, it shows a kohen duchaning, men giving malkos, a kappara ceremony, a Torah, mezuzah and magen david, lulav and esrog and a halitzah boot. Great illustrations although it must be said that the lulav looks suspiciously like a feather. Catalogue your books or look at others at Library Thing. Hey, it's new to me. In this Wolfish Musings post about the Lakewood internet ban a commenter called Queeniesmom mentioned C.S. Lewis's Chronicles of Narnia series. i was severely chastised for letting my 7yr. old read the narnia chronilces. silly me, i was happy she was reading and that she wanted to read. we read many of the books together and i still don't see how this would warp her. to her it was a fun story - any symbolism it might have had (i'm not sure i buy it but that's another whole story) was lost on her. Now I happen to think that the Chronicles of Narnia is good reading for children and that any Christian symbolism is completely lost on Jewish children--certainly at seven years old. However, despite Queeniesmom's skepticism, the Chronicles is certainly a Christian allegory. Apart from the obvious parallels (and less obvious ones, including the name of Aslan, which means 'lion' as in 'Lion of Judah') C.S. Lewis, as a Christian theologian, openly regarded them as a Christian tale--a fantasy rendering of much of the Greek Testament in fact. The books are as full of Christian Biblical symbolism and interpretation as pomegranates are full of seeds. Since we're on the topic, I wonder what a Jewish Chronicles of Narnia might look like. Any Jewish writers want to give it a go? Here's an interesting review of Artscroll's RCA version of the siddur. It is a typical critique of Artscroll, the kind I thoroughly enjoy. I have to say that the reviewer, Arnold Jacob Wolf, gave me a good laugh. This siddur makes him so mad and apparently drives him crazy and that's what's funny. Wolf cleverly calls Artscroll "neo-frum". He says that it is " fascinating, and infuriating" and, of course, "too obscurantist to accept". He notes that "All of the Song of Songs is given with a richly allegorical interpretation that borders on the ludicrous" and that "God created the whole world with the Hebrew alphabet (whatever that may mean) and if you don't believe it, you must refer to the Artscroll volume on "The Hebrew Alphabet, An Overview" (p. 1196)" Tachanun is midieval: "Many physical responses are mandated: bowing, stepping back, holding one's face in one's hand. Imaginative typography and bright, rather gaudy, covers, do not obscure the medievalizing sensibility of the RCA Siddur or its retrograde implications." [A]t Mesorah Publications, Orthodox publishers of Artscroll Library's Stone Edition Tanach (1996), general editor Rabbi Nosson Scherman says he has seen a demand for an English-only Tanakh, much of it from the non-Jewish world, especially evangelical Protestants and Catholics. "There is an increased interest on the part of many people, possibly people who are interested in the Bible as literature, who want to know how the Bible was understood by Jews before King James got around to it," [Rabbi Nosson] Scherman notes. Okay, R. Scherman is clearly referring to the anthology-commentary in the Stone Edition. But the translation uses a great deal of terms taken straight from the King James! An early example is the translation of Genesis 4:9, hashomer ahi anokhi, as "Am I my brother's keeper?" I can promise that if the KJV had never existed and someone was translating the Torah into English for the very first time today they wouldn't have naturally employed that sentence. It would be interesting to search the Stone Edition for KJV phrases, but someone else will have to do that. Suffice it to say that the King James shadows it throughout. It's certainly possible, if not likely, that the anonymous translators of the Artscroll chumash did not consult the KJV even once because to a very real extent the King James Version is the template in English through which each Bible translated into that language must pay its respect. Who among English speakers does not know that Cain's retort to God was "Am I my brother's keeper?" Traditionally one of the fast days, 10 Teves, was taken to mark the translation of the Torah into Greek, an event deplored according to this tradition and likened to the caging of a lion.Apparently an English rendition of the Torah, even one produced by Orthodoxy's RW publishing giant can't escape it. Other Jewish translations use the phrase, and not just ones like the JPS translation. R. Aryeh Kaplan's Living Torah has "am I my brother's keeper" as well--but he has the King James in his bibliography. There is no James, kingly or otherwise, in the back of Artscroll's Chumash--but its presence is certainly there. It's probably rapidly going to become a hashed-to-death cliche to dissect the Lakewood internet ban. But clearly I'm not going to let this by without commenting. Obviously this is draconian. But rather than just being prescriptive, let's be descriptive. Firstly, no one should deny that the internet truly is a threat to traditional ways of life. It is. Secondly, the internet is not all amazon.com and online bill paying and [insert the newspaper of your choice]. It's got dark corners, probably most of it is dark. The truth is that if Lakewood will continue to be Lakewood (and if Lancaster, PA will continue to be Lancaster, PA or if Riyadh will continue to be Riyadh) then it probably can do so only without widespread internet use. However, it's difficult to believe that this ban is being promulgated from a position of strength. I don't pretend to have some kind of proactive formula for them that will work, but it's hard to see how the reactionary approach they've taken will really succeed in the long run. The language of the ban clearly recognizes the unescapable fact: many people really need internet access. And many people will have it. Even if having internet access requires rabbinic approval, I can assure you that they will be unable to monitor people's private use. On the other hand, maybe this ban is really meant only as a da'as Torah litmus test, a kind of periodic status report on the haredi world of Lakewood, NJ by the powers that be. Or maybe its only meant for the taye'reh temimusdike yungerman and especially their children and families, the people who will take the ban very seriously but who otherwise might have innocently slipped that free AOL disc into their computer and double-clicked setup.exe. I need not remind my Conservative colleagues what is kavod for a teacher and how the Talmud cautions us against "pronouncing judgement in the presence of one's teacher." A hundred halakah committees cannot overrule one Professor Saul Lieberman! Jewish law is not decided by the raising of hands at a rabbinic convention. Modification and interpretation of Jewish law are vested with acknowledged authorities. These authorities, for the Orthodox rabbis, are in the yeshivah which trained him, and, for the Conservative rabbi is it, and should be, his Seminary. A few years ago in a book store I came across a mostly silly little book called "Jews Who Rock". It's about, yes, Jews Who Rock. Well known are the Bob Dylans (nee Zimmerman) or Paul Stanleys (nee Eisen) but lesser known are the Mike Bloomfields and Sylvain Sylvains, all Jews Who Rock. Last night I sat with a friend who has a tremendous passion for searching out the truth. He is a very intense fellow who sometimes leans a bit far out with his conspiracy theories. We discussed different topics, varying from the origins of HIV virus to real cures for cancer. He believes that a lot of misinformation is being disseminated by pharmaceutical corporations who want to drive the drug industry. As the night grew more heated my friend began bearing down on the theory that Jesus never existed, nor did Moses. He claimed they were invented by the powers that be to control the masses. That people need myths. Something to believe in. The Bible, he said, was written and edited by so many people that there isn't any real truth to it. Here was a fellow that I enjoyed speaking with, and I appreciated his thirst for knowledge. But at that moment I broke down. I said to him, "You know when you tell me that the Bible was invented by someone....and it never happened, that is like telling me that I am not real, because you are speaking about my family. Because that book is a history of my family. My name, Peretz, was chosen in honor of one of those relatives. You see, the Jewish people, whether they understand it or not, are living proof that they are not myths but real history. And because we are kept alive this very day is in fact proof that God exists because, if it weren't for his intervention, we wouldn't be here. And that is a reason to praise his name."